There are a number of things I love about the Anywhere Festival. In particular, I get to visit some really great spaces, and I have the chance to ‘find’ performers or works I might not otherwise have spotted. But one of the greatest risks at venues which are not typical theatres is that sound quality can be poor: too difficult to catch every word or music ramped up too loud, even to the point of distortion. There is clearly no risk of sound malfunctions happening at The Bison Bar. The Bison Bar is an intimate coffee and cocktails bar which evokes the glamour and style of the 1920s, and provides a great space for cabaret and live music (lucky Sunshine Coast residents and visitors). And the owners also run a recording studio (lucky Nambour artists), so they ensure that the sound support is exceptional. Cabaret at its best often combines the quirky with a strong and well thought-out theme, great music, solid comedy, and close observation. Bethan Ellsmore really is ‘Queen of the Night’ in this show—and ticks all of the cabaret boxes with this production. The Penny Challen frock is perfect (only midnight blue would do, after all), the tiara well-judged, and Bethan-just-call-me-Your-Majesty-Ellsmore has a wicked sense of humour and a fabulous voice to match. In just one short hour, and with 12 great musical choices, we learned a little about love and loss… and had the opportunity to revel in a spine-tingling voice, hear Ellsmore play the piano and the electric violin, and generally see a cabaret artiste doing what she does best. The set illustrated the theme with plenty of references to the moon, to Queen and of the night. The numbers allowed the ‘Queen of the Night’ to demonstrate that she is equally at home with a Czech operatic-style song to the moon, Brecht (Surabaya Johnny), the musical number "I Will Wait for You," and more contemporary choices including songs by Portishead (Glory Box), Kings of Leon (Molly's Chambers). And yes, of course, Queen’s ‘Killer Queen.’ My favourite pieces of the night had to be The Animals’ ‘Don't Let Me Be Misunderstood’, that Czech song to the moon, and the finale (a powerful rendition of Sia’s ‘Chandelier’). 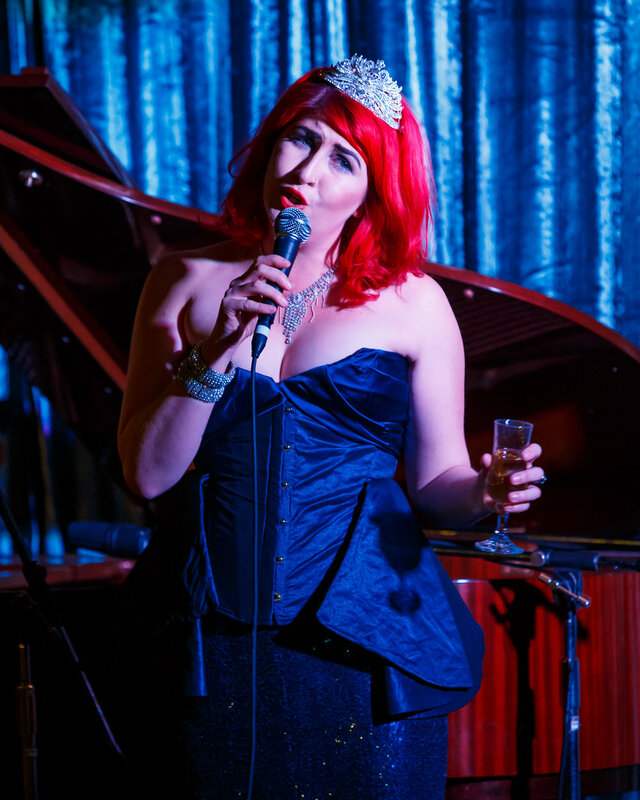 Bethan Ellsmore’s Queen of the Night was part of the 2017 Anywhere Festival program for two nights—at the fabulous Australian Modern in Carina (5 May 2017), and at The Bison Bar Nambour (6 May 2017). If you missed it I’d suggest you follow Bethan Ellsmore (https://www.facebook.com/bethanellsmoreperformer/) and see if you can find a chance to hear that fabulous voice, and to see the Queen of the Night sometime. The reviewer saw Bethan Ellsmore is… Queen of the Night at The Bison Bar, Nambour, on 6 May 2017. Tickets ($30) were available at http://anywheretheatre.com/listings/queen/.